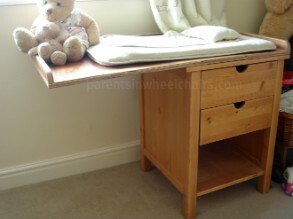 This was our changing table.........a table-top bolted to the top of a bedside table. By not adding table legs to the left hand side, it was easy to manoeuvre my wheelchair underneath and get close-up to Sarah. As Sarah got heavier, we bolted the ride side of the bedside table to the floor to prevent the whole thing from tipping over.